The Hannon laboratory has a strong history of innovation, and is responsible for the introduction of several new technologies which gained wide adoption in laboratories all over the world. New methods often lead to paradigm shifts in the way biological problems are approached, allowing us to look further, reach deeper and act with more precision on living systems. This has helped our laboratory to remain on the forefront of research over the years. While technique development is a worthy endeavour in itself, at the core of each new methodology is one of the questions asked by the laboratory. Tool creation and basic research are two sides of the same coin and form a positive feedback. Our laboratory hosts people with different expertise and mind frames, and we always seek collaborations with other groups working on different disciplines, from chemistry to optics to bioinformatics. The middle ground before many different fields, in science, is often fertile and can provide unexpected solutions to old problems. The Hannon laboratory was the first to develop in-situ oligonucleotide synthesis on microarrays as a way to generate complex oligonucleotide libraries (Cleary et al., Nat Methods, 2004), a procedure which has since became commonplace. This, in turn, allowed the development of genome-wide shRNA libraries for several animal models, which are now publicly available and widely used (Silva et al., Science, 2008). Over the last 10 years, the laboratory has used these libraries to perform many genome-wide screens for genes involved in tumorigenesis, drug resistance and small RNA biogenesis. 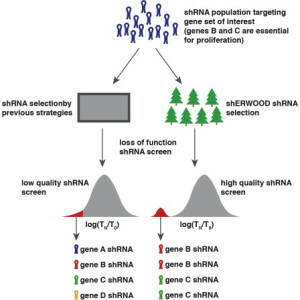 Recently, we are developing combinatorial shRNA libraries, which will allow to test pairwise combinations of a large number of genes for synergistic or antagonistic effects linked to cancer progression. We have developed tools for genomic research, too. In 2007, we developed the “Exome capture” technology to selectively sequence a small fraction from whole genomes, allowing the pooling of many medical samples in a single data run on most next-generation sequencers (Hodges et al., Nat Gen, 2007). This technique had some unexpected applications, since it was at the basis of a multi-laboratory initiative that led us and our collaborators to the successful sequencing of the Neandertal genome, which revealed some surprising insights into the evolution of our species (Burbano et al., Science, 2010). Recently, our interest in tumour multiplicity and evolution has led us to devise strategies to uniquely label individual cells and trace their behaviour and lineage using DNA barcodes. We are currently working at several methods to generate barcodes, read them in vivo (possibly through some variant of in-situ sequencing techniques), analyse them, and use them as targets for intervention. We expect this approach to enable us to investigate both physiological (i.e. development) and pathological (i.e. tumorigenesis) events from a unique perspective. In the last four years, we begun a project aimed at the development of tools for the recovery and manipulation of proteins using light. This suite of techniques, which we collectively named “LaserTAG” after the popular game, is based on the use of a small chemical molecule that can selectively bind to specific cellular proteins when activated by a light beam (a photocaged chemical tag). By controlling the structure of this molecule, and fusing it to different cellular partners, we are able to selectively pull-down biomolecules from a specific cell population, or even from sub cellular compartments. 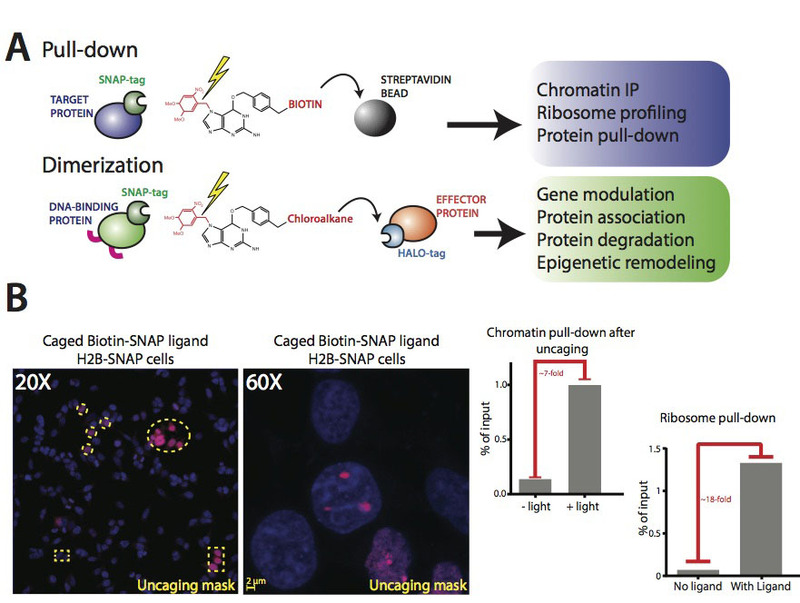 Using a variant of the same technique, we are also generating light-activable versions of several genetic alteration system (including transcriptional activators, repressors, and DNA recombinases). We believe that ability to use focused light to read, write, and alter specific cells could be as useful to many fields as optogenetics has been to neuroscience.